Photo Booth Industry Statistics – As an industry grows and matures, trends come and go and things change. So is the case with the photo booth industry. Birthed in the early 2000’s, it didn’t start to take off until 2008 and didn’t hit today’s level of demand until 2012. 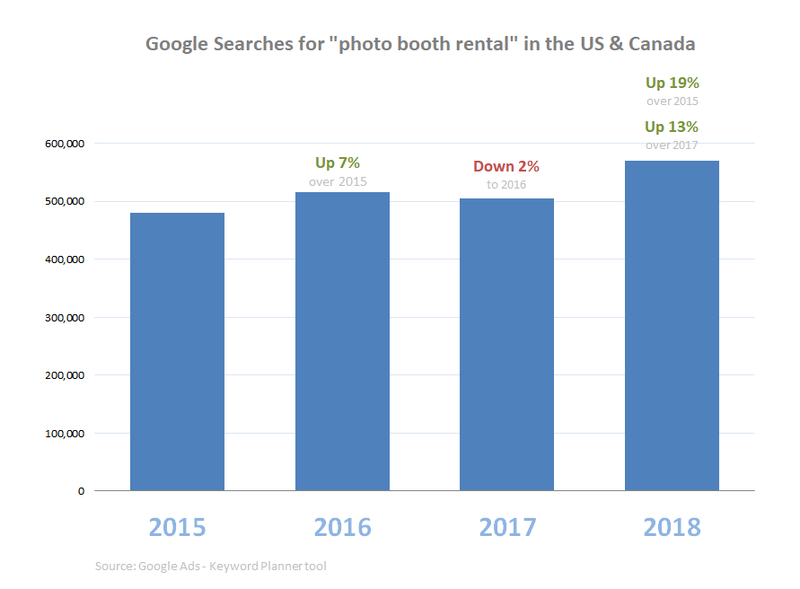 If the numbers of searches people are performing on Google across the US and Canada is any indication, demand for photo booth rentals is still growing. 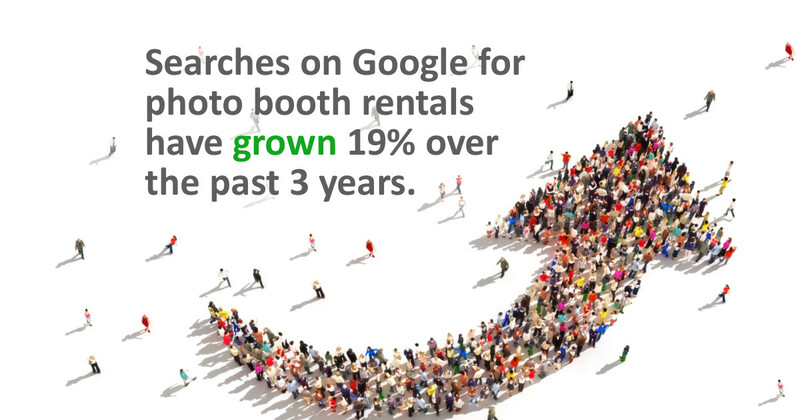 Over the past 3 years, searches for the ever popular search term “photo booth rental” have increased 19%! With this search phrase alone often averaging close to 50,000 searches per month on Google across the continent, it’s a great barometer of the demand for photo booth rentals. Searches on Google for “photo booth rental,” one of the biggest search terms in the industry, have increased 19% over the past 3 years. If anyone was still wondering, the photo booth industry is clearly here to stay. But if you’re paying attention to this industry, at times you probably wonder what’s changing? What trends are fading and what aspects of the industry are strengthening? These are big questions, and we definitely don’t have all the answers, but we’ve recently done some research and we’re happy to share what we’ve discovered. To really dig into what’s happening in the photo booth industry, we mined Google search data in the US and Canada using their Google Ads keyword research tool called “Keyword Planner.” We asked it to go back as far as it could – which happens to be to December 2014 – and give us all keyword phrases that people search for that relate to photo booth rentals. We then sorted and grouped the results into themes so we could make sense of it all. Below are the high level summary results comparing the three month period of September, October, and November 2018 (November was the last month they provided data for) to the same period in 2015. We chose to use three month groups like this to reduce the impact of occasional monthly spikes that can occur in the data. Searches for “photo booth rental” are up 22% (this phrase often averages close to 50,000 searches per month. Please note: this 22% comes from comparing a 3 month period. The 19% above is comparing the whole year). Everything related to wedding photo booths is up 14%. Searches for birthday party photo booths are up 25%. Searches for “portable” or “mobile” photo booths are up almost 25%. Searches for a “corporate” photo booth rental are up almost 30%. Search volumes for this topic, though, are on the lighter side. Searches for “vintage” photo booths are up 15%. However, searches to actually rent a “vintage” photo booth are down 50%. Searches for green screen photo booths are unchanged. Searches for photo booth picture frames are unchanged. Searches for photo booth backdrops are unchanged. However, searches for “custom,” birthday, and silver photo booth backdrops are up. Searches looking for price or cost information are down close to 6%. Everything related to “video” with photo booths is down close to 6%. Searches for “cheap” photo booth rentals are down over 12%. Generally speaking, searches for photo booth “ideas” are down 11%. However, searches for birthday party and wedding reception photo booth ideas are up. Searches for photo booth printers are down 18% (the major searches in this category still add up to well over 5,000 searches per month). “Do it yourself” or “DIY” photo booth searches are down 25% (this still represents around 8,000 searches per month). Searches for “open” photo booths are down almost 25%. Searches for photo booth props are down almost 30% (this still represents around 16,000 monthly searches). Searches for either a photo booth “discount” or “groupon” are down 45% on average. Searches for anything photo booth related with “instagram” in it are down 46% on average. Searches for “photo booth franchise” are down 58%, and searches for the names of a lot of photo booth franchise companies are also down significantly. Searches for “photo booth effects” are down more than 80%. There are of course other photo booth related search terms that are up or down, but our approach was to generally try and focus on searches that have larger volumes behind them. We hope these photo booth industry statistics were informative. Are there any photo booth related topics you’re wondering about? Let us know in the comment section below or by emailing us. We may dig into this further in the months to come. So feel free to offer your suggestions. We’re just launching this blog along with a monthly newsletter. Subscribe below to stay in the loop and receive an overview every month of what we’ve come out with: interesting industry trends and research, pro tips to help your business succeed, and our new photo booth template layouts.